Silent horror films have a unique method of delivering scares all their own. The unsettling nature of silent horror films are the result of several combined elements; eerie organ music, dark and grainy picture, actors with too much make-up looking very unnatural, etc. Silent horror films may not be very “scary” to today’s crowd, due mostly to their slow pace and text cards cutting into the action, but they do create an atmosphere that can’t be accomplished by any other type of horror movie. 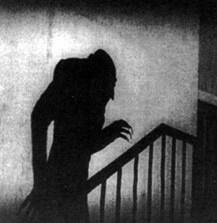 The original F. W. Murnau version of Nosferatu is the finest example of effective silent horror and one of the most influential films of the entire genre. A quasi-retelling of Bram Stoker’s Dracula (albeit, made without permission), Nosferatu tells the story of a man named Thomas Hutter and his encounter with the grotesque vampire, Count Orlock. Thomas Hutter is a real estate agent who travels to Count Orlock’s remote castle to close a deal. Orlock is interested in moving to Bremen, Hutter’s home town. Orlock is a real freakshow, and Thomas soon develops and uneasy feeling in his presence. Orlock moves to Bremen where there’s plenty of fresh blood, and soon becomes enamored with Thomas’ wife, Ellen. Count Orlock makes it his obsession to drink Ellen’s blood and it doesn’t look like he can be stopped. This movie is defined by several factors, but the most recognizable of all is certainly Max Schreck, the man who played Count Orlock. Nosferatu predates the likes of Bela Lugosi’s Dracula and paints a very, very different picture in regards to vampires. Count Orlock is not an attractive, “tall dark and handsome” gentleman. Far from it. In Nosferatu, vampires are vicious, vermin-like grotesqueries. Max Schreck just doesn’t look human, which is even more alarming, considering the extent of his make-up were false teeth and pointy ears. Schreck adds several touches to the character beyond just his freakish appearance. For instance, Orlock never once blinks during the entire film, adding a very subtle yet bizarre touch. Another aspect of the movie I feel compelled to compliment on is the directorial tricks and creativity in regards to the supernatural powers and unearthly abilities of Count Orlock. The way he rises from his crate (not a coffin, mind you) on board the cargo vessel as stiff as a board is very striking and one of my favorite moments in the film. Probably the most memorable element is the use of shadows. Orlock’s shadow can be seen creeping up the stairs late at night with his body nowhere in sight. The shadow of his hand can reach across a woman’s chest and clutch her very heart. All these effects are exceedingly simple yet brilliant all at once. I suppose the one effect I didn’t like was their interpretation of “supernatural speed” in which they use fast-motion to speed up Count Orlock’s horse and wagon. It just reminded me too much of the Munsters. Nosferatu is one of the best silent horror films ever made, ranking up there with the Cabinet of Dr. Calgari, the Phantom of the Opera and the Lost World. It holds up remarkably well for a silent film, due to its rewatch-value and innovative directorial style. It is an early look at what people thought of vampires before Dracula turned them all into pretty boys. I agree that the sped-up motion was a little cheezy. There were some pretty slick dissolves in there though that ended up looking very haunting. The scene below the deck of the Demeter was a great one.